Interior or Allen Bros & Snider Hardware Store, 1907 with men shopping. Photograph of E.J. 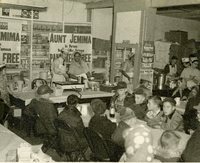 Hesselsschwerdt and Aunt Jemima cooking pancakes inside store. Scene of downtown Kalona in winter. Vintage cars and a snowplow. 1905 Photograph of B avenue, looking west, showing C.F. Howard General Merchandise and Howard Blacksmith. 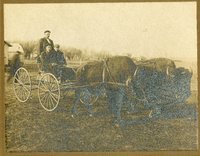 Two buffaloes in front of a buggy with three men in the wagon. Page from August 1999 calendar showing the building at the corner of 5th St. and C Ave as it appeared in the 1920's as the Buick Garage. In the 1990's it was Miller's Medicine Cabinet.